Terrie is Tammy’s twin sister. When she is not working on dementia and cognitive research and training, she enjoys spending time with her husband, family, and grandchild. In 2001 Terrie, Tammy, and Paula purchased a non-medical home care company. Their continued success through 2007 led to the purchase of a second franchise. In 2008 the trio decided to branch out on their own and found Dynamic Senior Solutions. Terrie enjoys working with the senior population and their families. Terrie’s nursing background spans 15 years as a staff nurse, educator, and liaison between patients and physicians for Miami Valley Hospital. She was honored in 1996 with its “Excellence in Leadership” award. Terrie co-authored a feature article in the Nursing Case Management Journal in 1998. Terrie serves as cofounder and vice president of research/training at Dynamic Senior Solutions. Tammy is Terrie’s twin sister. When she is not training or researching dementias and cognitive impairments for Dynamic Senior Solutions, she enjoys time with her husband and three children. In 2001 Tammy, Terrie, and Paula purchased a non-medical home care company. Their continued success through 2007 led to the purchase of a second franchise. In 2008 the trio decided to branch out on their own and found Dynamic Senior Solutions. Her background includes 16 years of working in the senior industry, five years of Workers Compensation injury claims experience, and three years working with the mental health population. Tammy has a bachelor’s degree in rehabilitation. Tammy serves as cofounder and vice president of research/training at Dynamic Senior Solutions. She also serves as director of Dynamic Senior Solutions’s nonprofit 501(c)(3) arm. The Dynamic Senior Solutions Foundation was established in 2016 to assist individuals and families struggling with a dementia diagnosis. Tax deductible gifts are used for supportive services, education, and sponsorships for research and development. Paula has been a friend to Terrie and Tammy since childhood. When she isn’t working on business development, dementia and cognitive research or training for DSS, she loves to spend time with her husband, three daughters, and three dogs. Her idea of a great day outside of work is a sunny walk on the beach. In 2001 Tammy, Terrie, and Paula purchased a non-medical home care company. Their continued success through 2007 led to the purchase of a second franchise. In 2008 the trio decided to branch out on their own and found Dynamic Senior Solutions. Paula’s background is focused on the senior industry. Her work experience includes 16 years at Miami Valley Hospital as a clinical nurse educator. Paula serves as cofounder and vice president of research/business development of Dynamic Senior Solutions. Our lives have each been directly impacted by loved ones suffering from memory impairment. Over time, we developed a sincere passion for providing options for individuals interested in preserving and improving cognitive function. We have been business partners since 2001 when we acquired and substantially grew several non-medical home care franchises. We know it takes a special person to care for the delicate and unfolding needs of the dementia population. Our team of hand selected employees is truly passionate and gifted with the skills set and understanding necessary to care for your loved one. We take pride in managing a workforce that is highly trained, educated, and experienced. Our professional approach, qualifications, experience, and attention to your needs fully set us apart from the competition. At Dynamic Senior Solutions, our team continually evolves, learns, and grows. We stay current with the latest research in all facets of dementia care and brain wellness services. 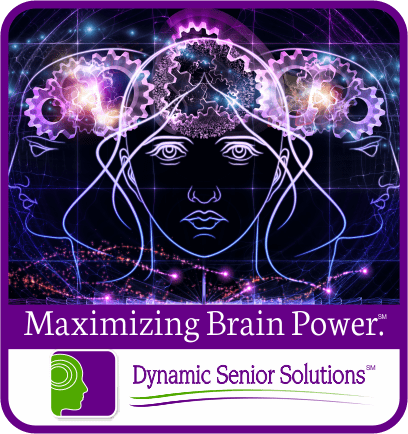 The staff of Dynamic Senior Solutions includes Certified Dementia Practitioners (CDP) and Instructors of the Alzheimer’s Disease and Dementia Care Seminar, as authorized through the National Council of Certified Dementia Practitioners (NCCDP). We have Registered Nurses on board with extensive medical expertise. We are certified trainers of Teepa Snow’s Positive Approach™ to Care, Dynamic Senior Solutions is also certified cognitive educators of The Serper Method, an innovative program of brain activities designed to improve cognitive skills, social skills, and memory for all ages; My Vigorous Mind – Total Memory Workout, an Internet based brain wellness and brain fitness program through Ohio distribution partner Vigorous Mind, Inc.; and Reality Comprehension Clock Test (RCCT) and Communication Programs.